Early in the dark hours of Wednesday, May 11th, I will go to SeaTac and board a plane for Denver. I don’t like air travel, but there is something about being at an airport that screams “adventure!” at me, and it will mean some much-needed time away from reality, so I’m actually looking forward to getting up that early even though I will complain (loudly, on Twitter probably). Now, the Rockies were not my first choice; originally, this trip was supposed to be for Chicago and Milwaukee; a friend of mine is a huge Cubs fan, and we were going to go see both the Cubs and White Sox, and take a road trip to see the Brewers; but for now, that has to be put off a little longer while I pay off my last remaining veterinary bill for JJs surgery last year. I am hoping to be able to afford it by next summer. The Rockies came into existence around 1993, and played both their ’93 and ’94 seasons at a place called Mile High Stadium. 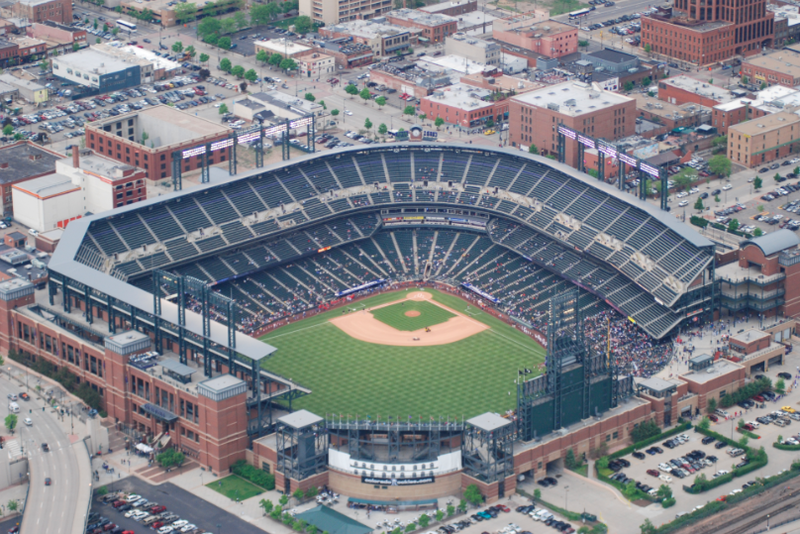 Then the Coors company bought naming rights to the new stadium, which opened in 1995, and that is where the Blake Street Bombers have lived ever since. I will be attending two games vs the Mets on Friday the 13th and then Saturday the 14th, sitting in two different areas of the stadium. I originally figured I’d only go to one game, but I’m there, I might as well go to two. Plus, with a stadium that was reportedly designed by the same people who did Safeco, I figured that there would be a lot of cool stuff to make sure I got photos of. If you look off to the side of the top of the lower picture, you can sort of see a light purple line that runs around the seating in the upper deck. 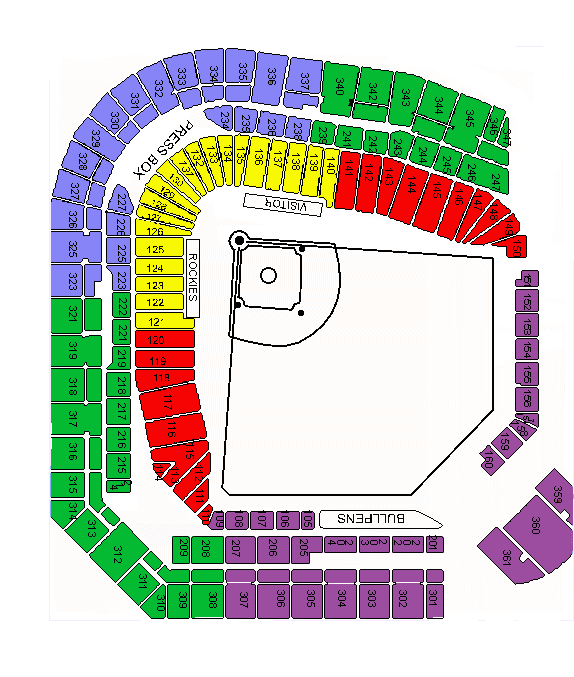 And section 331 is pretty much the same place as it is in Safeco. An approximation of the view from 331. The outcropping in center field is an area called the Rockpile, and when the Rockpile seats existed in the old stadium, they were a buck apiece. Now? Around $4-6. That is correct; $6 for a major league ball game. I’ve been a fan long enough to remember when Safeco’s center field bleacher tickets sold for $10. Those days are long gone. 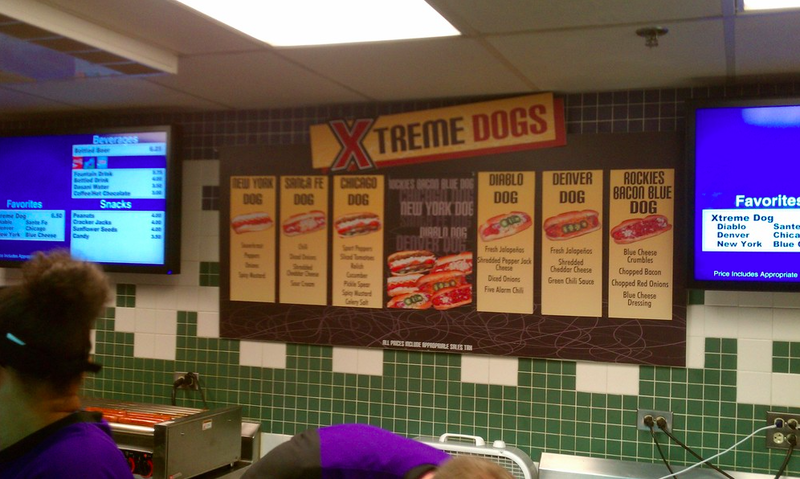 Kudos to the Rockies for keeping their prices down. 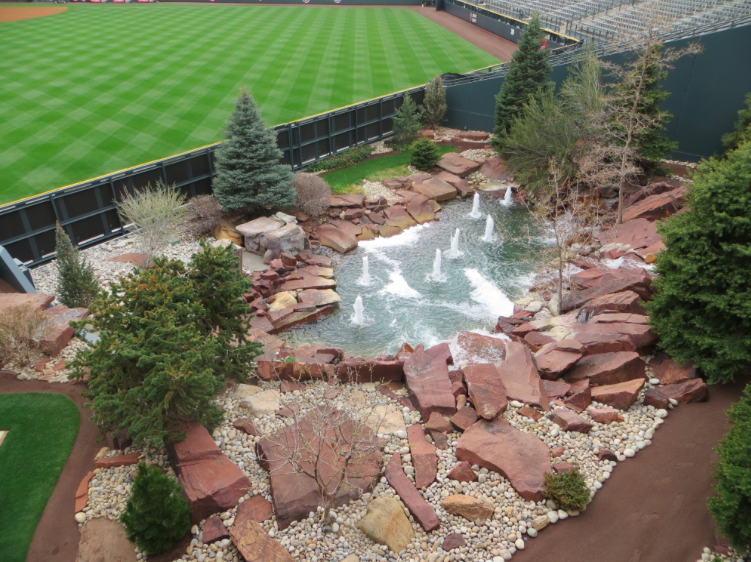 During game broadcasts throughout the season, the ROOT Sports team is reliable for at least two things; a visit to Gates BBQ in Kansas City, and focusing on the Coors Field water feature. The water feature sits in the batter’s eye, and prior to actually reading up on it, I thought it was something that you could walk through; a public destination like maybe the little kids ballpark outside of Kauffman Stadium. Unfortunately, it is only for decoration, but it is really close to the bullpens, so conceivably, a baseball could get lost in the woods during warmups. So now we’ve got some of the big stadium stuff out of the way (I am sure that the art direction there will also be fun to discover, and I’ve got two days to do it), the tickets are bought, the rivalry is set, and the important part must be planned out; what to eat and drink while I’m there. You may scoff at my prepare-ahead attitude on food, but ballparks have so many choices these days that I have to plan what I’m doing so that 1) I don’t spend valuable picture-taking or trinket-shopping time running around the ballpark to find stuff to eat, and 2) I have a general idea of where everything is. Before I went to Citizens Bank, I knew that Tony Luke’s was in center field, and Yuengling was everywhere. That gave me time to feel comfortable just walking around the park and taking pictures, getting a feel for the place; the water ice upstairs that I didn’t know was there was an added bonus. As was the bacon on a stick I ran into at Camden. So what are we looking at in Denver? Well, I’ve been told a Helton burger must be part of my trip. Andrew Martin at Purple Row reviewed it a few years back, and while the $14 price tag from 2011 has probably gone up a bit, I can deal with a nice burger for dinner on Friday. Also, the onion rings look fantastic. Saturday night, though, it’s all about Extreme Dogs. Check out this menu! Coors Field also has The Sandlot, where Blue Moon makes their marvelous light wheat beers, and The Rooftop, which looks kind of like The Pen, but upstairs instead of under the park. I won’t be going to The Rooftop, as unlike The Pen, tickets are required to get in there specifically. But I will gladly nurse a beer at the Sandlot on Friday/Helton Burger night. This is the bit where I address the elevation. I’ve been to Denver before, enough times to know that one good beer (ie; not weak, watery commercial beer) is enough if I want to keep my head on. My foreign ballpark limit is two, but I think I might have to cut that in half for this trip. I’d like to post some photos here that don’t look like I took them from a moving car on a dirt road. So I’m going to try and find something that I can’t get here at home; I could not find a beer list on the Rockies’ MLB.com site, but I am guessing that a place called Coors Field in a town like Denver will probably have a lot of options. The gates at Coors Field open two hours before game time. This doesn’t feel like enough time to see stuff to me, but it totally will be. I am headed for either the A or E gates so I have as much time as possible to take everything in. There are multiple lots around the stadium to park in, all $15, and again I have to give props to the Rockies for keeping parking reasonably affordable. I have my secret spots in SoDo for the Mariners, but independent lots there to get pretty out of control. Even Camden had $10 lots all around the ballpark. Bonus prize if you’re in the area; The National Ballpark Museum on Blake Street, less than a block or so from the stadium. We do plan on going to this one as well; like a tiny Cooperstown in the mile high city! I am sure I have probably missed a ton of things, but that’s what makes the visit more fun; a basic knowledge of the park and the area to get your bearings, and all the other things discovered during the trip fill in the gaps. Just two and a half weeks away. I can hardly wait! Pictures used without permission, credit Purple Row and The Denver Channel. 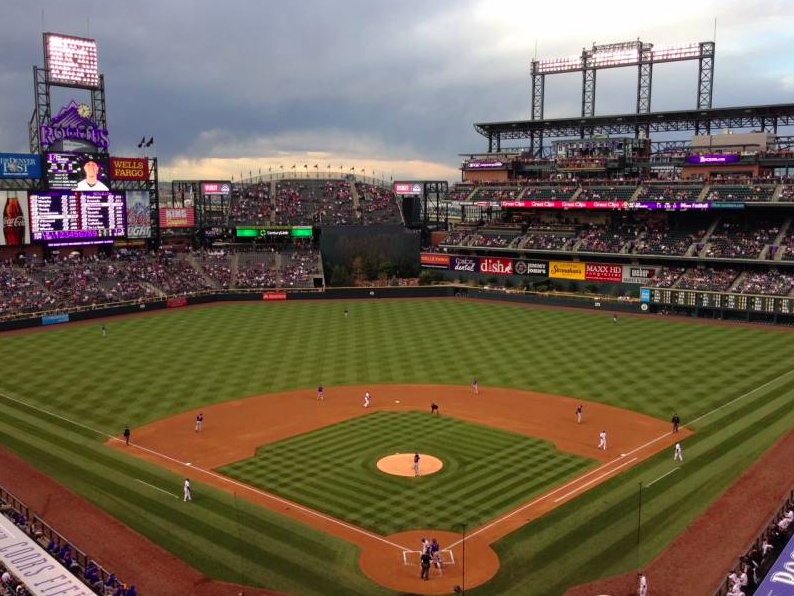 This entry was posted in 1 and tagged 2016, Coors Field, Stadium preview, Stadium Tour. Bookmark the permalink. Just a heads up, you don’t actually need a ticket to get into the rooftop area, unless it has changed this season. Ooo! Good to know. I was looking on their site and it did say “Rooftop tickets”, but maybe I misread it. That would be great if so, since if my geography of the area is correct, the Rooftop would allow for a good view …west? -ish?